This post is full of easy rental decorating ideas – and simple decorating ideas for anyone not in their forever home. It’s been a (crazy) year since we got the keys to the rental house. We’ve done a LOT of painting, cleaning, decorating and even furniture building so I thought I’d share what we’ve accomplished at the rental house in a year. If you’re renting – or own but are thinking you’re not in your forever home – this post is full of rental decorating tips and DIY projects we did to this house knowing we wanted to spend time on projects that could easily come with us and that we’d benefit from long-term. Hopefully it sparks some fun house project ideas for you! That being said, we painted all of the walls in the rental house, which obviously contradicts the thought of focusing on projects you can take with you, but wall color makes a HUGE difference in the feel of a room, and some walls are just in desperate need of it. It’s extra work you won’t benefit from in the long run, but I’d say it’s way worth it if the walls aren’t a pretty neutral shade you can work with. Speaking of, I’ll include paint colors and links/sources for the decor pieces below, but since this post will be a bit long, I’m sure a few things will get missed. You can see where we got everything in the rental house on the ‘Get the look: rental house’ page and see a list of the whole house paint colors here if you’re curious about anything. We painted in here (Agreeable Gray) and got a rug … and haven’t done too much else. I’m just finishing painting a little round table for in here that I’ll share on the blog in the next few weeks. I really love how this room came together for a coastal, casual space. 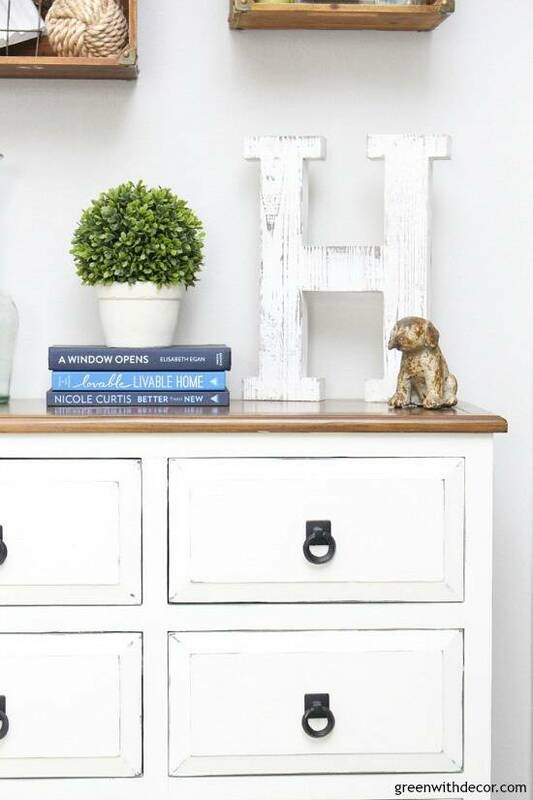 … hung crates as shelves on the wall and painted a few pieces of furniture, like this white farmhouse chest, blue end table and TV stand that is still may be my favorite ever Facebook buy/sell group find. Renting is hard in that there’s some things you just can’t do… like that fireplace really needs a fresh coat of paint, and I’d love to paint the brick white. But it’s nice to focus on projects we can take with us that also make the room feel like ‘us’ – like the painted furniture and the gallery wall. The round wood coffee table and gray round mirror are two of my absolute favorite things we’ve ever bought, and I just love them in here. You can see more of the coastal rustic living room here. We’ve been close to calling this room done for a while and are almost there … the cold spring and pregnancy definitely slowed down the staining and painting of some furniture pieces in here! The biggest projects in here were painting the walls (Agreeable Gray) and building a farmhouse dining table (still can’t believe we did that!). We’re *this* close to being done with building the benches, which will go up on the blog soon. Can’t wait to put the folding chairs away for good. In the meantime, it’s been fun putting together all sorts of centerpieces and tablescapes! For other smaller updates in here, we bought a rug, added chairs to the heads of the table and hung these dry bushed windows turned picture frames on the walls. Again all easy rental decorating ideas if you’re in the same boat – everything can come with you! We put the painted desk in the corner for a little home office nook. The kitchen is dark and not our usual style, but we brightened it up a bit by painting the walls Aesthetic White. We also swapped out the cabinet handles, added a rug and made a few other small updates. The big window box has kind of stumped us in here, but it was just perfect for our Christmas village, so I had to share a pic of it even though it’s not Christmas season. You can see more of our kitchen and read all about ways to update your kitchen when you can’t renovate here. We turned a blank wall in the kitchen into the perfect drop zone that might be my favorite ‘room’ in this house. 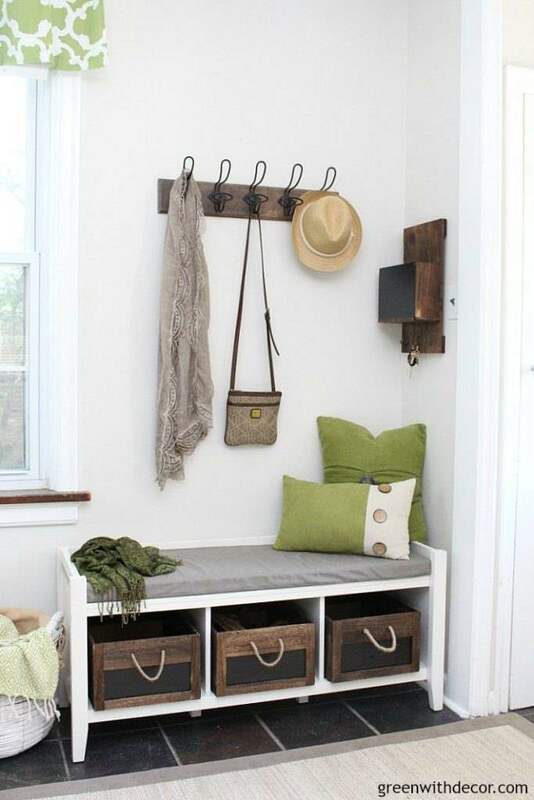 I really love those wood and metal hooks, the crates with the bench and the message center. It’s a small space, but it’s perfect for holding coats, boots, sunglasses, Oakley’s dog leash … all that fun stuff. 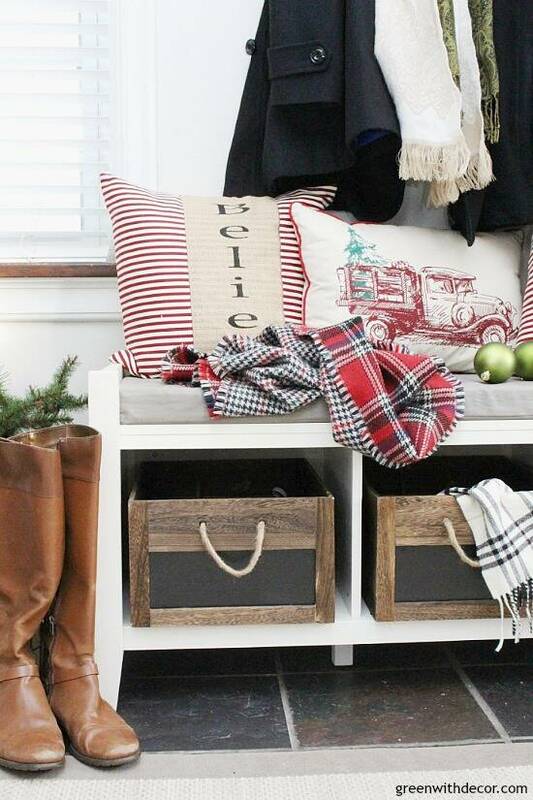 Plus the bench is fun for swapping out throw pillows in different seasons. You can see more of our organized mudroom here. This little bathroom turned out pretty cute, too. We painted the walls (Krypton), swapped out the mirror (such an easy update if you’re renting! ), got creative with storage (this room offers zero! ), turned an old wooden spool into a towel rack and did a few other little things. You can see how we updated this bathroom for just $100 here. This was basically just a slab of old concrete we covered with an outdoor rug, our patio set and, of course, throw pillows. Here’s a picture from last summer since we haven’t set anything up yet this year. We (Kalen) just painted our patio set. That was only on the to-do list for the past couple of years, whoops! But again, painted furniture is a great project to cross of the list when renting because you can take it with you. Once we get the patio all organized and set up, I’ll take some pictures and get this year’s patio up on the blog. You can see more of the patio here plus a bunch of ideas for decorating a rental patio. The Agreeable Gray paint goes a long way up here – the yellow just wasn’t cutting it! You can see more of the decorated hallway here. The bright orange is gone (whew). We went with Agreeable Gray in here, too. We painted (Agreeable Gray) over the bright blue. You can read all about painting walls with a paint sprayer here – it made painting go soooo fast! I also painted this little blue dresser that’s currently hanging in the guest room just kind of waiting for a home if this room ever gets put together. 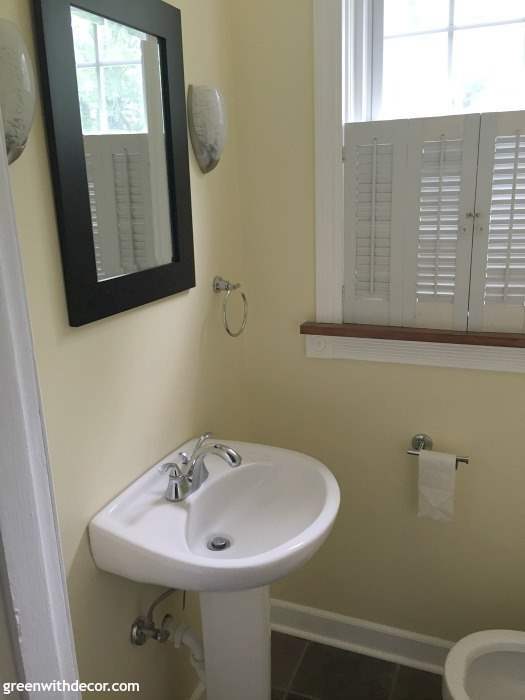 Ah, this is where the fact that this is a rental house really shines. Those counters! The light fixture! We painted in here (Ryegrass) and added a few decorative pieces to hopefully distract from those swirly countertops. You can see more of the guest bathroom here. I had big plans of making this room a priority for once since we all tend to leave bedrooms for last … but of course we really haven’t done much in here aside from buying a new comforter. Stay tuned! 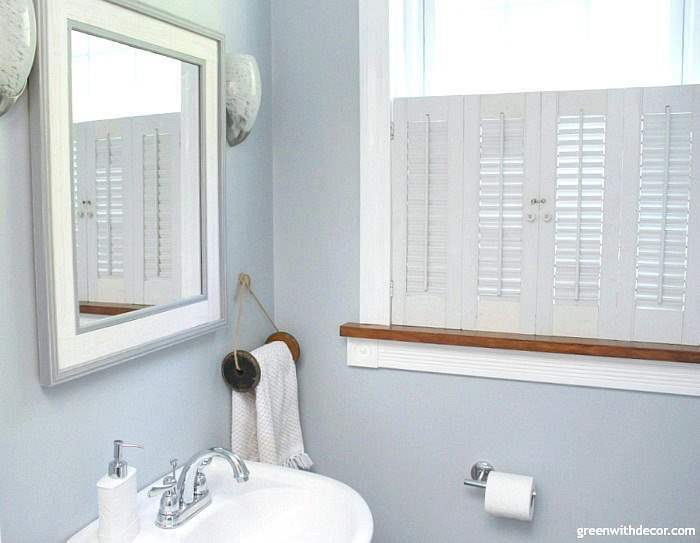 We updated this bathroom for just $100, too. We painted (Ryegrass), added cute towel hooks I found at a flea market, swapped out the vanity hardware, added some rugs and made a few other small updates. You can read all about updating your bathroom when you can’t renovate here. What you don’t see in this post is that most of the closets in this house are a hot mess. And the sunroom is just a huge dumping ground for extra furniture and decor that may or may not ever turn into a room we set up and enjoy. We definitely don’t have it all together over here, but it’s nice to have some rooms done so we can just enjoy them! Remember to take pictures of your house as you do different projects. It’s fun to look back at the before and afters, especially on days where you walk into a totally unfinished room and feel like the to-do list is never ending. Houses take time so if you have a hot mess of a sunroom, too, look the other way and think about all of the projects you HAVE done!